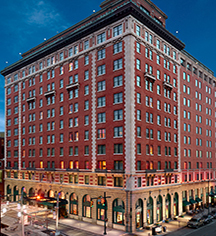 Guests of the AAA Four Diamond Omni Severin Hotel are treated the the conveniences of the prime downtown Indianapolis location in the historic Union Station Wholesale District. Located merely steps away from the world's first union station, visitors can experience the energy, arts, and culture in the now revitalized Wholesale District. The Omni Severin was strategically built across from the Indianapolis Union Station in an era where 25,000 passengers would pass through on 120 trains daily. When the era of passenger rail travel died, so did the prosperity of the Wholesale District. Modern guests of the Omni Severin Hotel can choose from 424 rooms, suites, and deliciously luxurious penthouses, all having undergone restoration and renovation. Public spaces and common areas maintain touches of the past while offering the comforts and conveniences of modern technology and amenities. Explore the arts, culture, and convivial nightlife in the once again bustling Wholesale District of downtown Indianapolis. Omni Severin Hotel, Indianapolis, a member of Historic Hotels Worldwide since 2010, dates back to 1913. The hotel retains many original fixtures from the 1913 building, including the crystal chandelier and mailbox. Airport Transportation: No airport shuttle service is provided by the hotel. Cancellation Policy: Cancellations must be made 24 hours prior to arrival. Cancellations within 24 hours will be charged one night's room rate and tax. Deposit: $50 per night deposit is required at time of check-in for incidentals. Hotel/Resort Fees & Taxes: The room rate is subject to a 17% combined occupancy and sales tax. Parking: Self-parking: Available; $22 per night. Valet parking: Available; $40 per night. Payment: All forms of payment are accepted. Payment is required at time of booking. Visa, MasterCard, Amex, Discover, and Diners Club are accepted. Pet Policy: Service animals allowed: Yes. Pets allowed: Yes. Restrictions: Maximum weight: 25 lbs. Fee: $50 non-refundable cleaning fee. Rollaways: Available upon request; $25 per night. Transportation: Car rentals are available through the concierge. Courtesy shuttle available Monday-Friday every 30 minutes within a 2-mile radius. 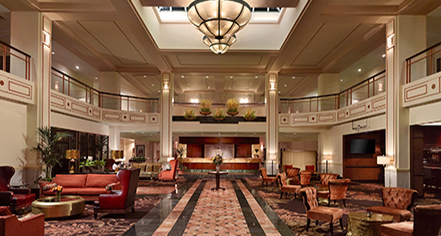 Learn more about the History of Omni Severin Hotel, Indianapolis .